Verifying Your Tags Has Never Been Easier! Google Tag Assistant is a free Chrome extension that helps you make sure your Google tags such as Google Analytics, Google Tag Manager, Adwords Conversion Tracking, and more are working correctly. Using Tag Assistant, you can make changes to your tags and instantly verify that they are firing as intended. Just navigate to any page and Tag Assistant will tell you all the tags that are on that page. You'll get a report of any errors found and suggestions for improvement. 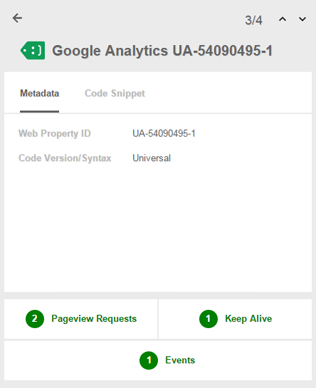 Google Tag Assistant Recordings lets you validate, diagnose, and troubleshoot issues with your Google Analytics implementation in real time. You can record typical user flows through your website and get immediate analysis of your set up. Google Tag Assistant Recordings can help you find missing or mangled tags, invalid events and filters, and much more. Insights about your users are only as good as the tools tracking them. 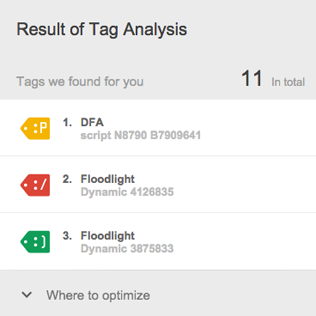 Tag Assistant lets you quickly see which of your site's trackers are working as expected. And if there are issues, Tag Assistant makes it easier for you to find solutions, ignore irrelevant tags, test changes, and get your website back to work. View data, code, and events. Tag assistant serves up every bit of info on your tags' metadata, as well as the corresponding code snippet. Additionally, events and requests are quantified and prominently displayed for a quick, scannable view of the impact your tags are experiencing. Like many Google products, Tag Assistant has an active and knowledgable user base. Our help center and Google+ community play host to a rich set of questions and answers for many Tag Assistant questions, and we're always encouraging our support resources to grow as needed. Explore Tag Assistant, a free Chrome extension, for yourself. Install it today, and start verifying your tags right away.